Amazing physics game. Protect your diamonds and coins from a rain of deadly pixels and blocks! 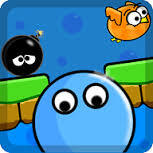 "Pixel Rain has very pleasant graphics and fun challenges. Overall, a great puzzle game." — AndroidPolice.comPixel Rain features:• Amazing physics engine – One of the top physics ever seen on an Android device make Pixel Rain an exciting and addictive puzzle game.• Hours of fun – 64 challenging, brain twisting levels are included and playable offline!• Unlimited fun – Hundreds of levels are available in the online mode!• Personalized fun – Create your own level with the level editor at http://f12.coBoth action and strategy will be required to solve this brain twister.Pixel Rain offers real world physics with retro style graphics and chiptune music, for those who are nostalgic of their old Game Boy, Commodore or Atari.Pixel Rain is available for old phones running Android 1.6 as well as the last Tegra based tablets!Troubleshooting:If you experience crash please disable the sound in the game. This problem may happen on GALAXY S II, and a few other phones which have a buggy sound driver.If you find bugs, please contact us by email [siliconstudiogames (at) gmail.com]. We are always eager to help!All trademarks remain property of their respective holder.